Overall look is very good. Top edge grille is solid. 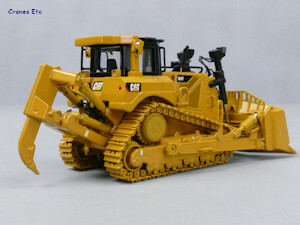 The Caterpillar D8T weighs around 39 tonnes. 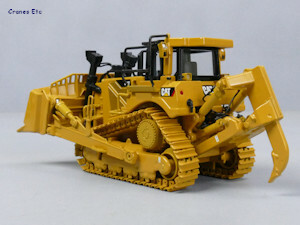 It is used for large earthmoving operations. The model comes in excellent packaging. There is an outer shipping carton which contains a tin which is protected by a nylon bag. 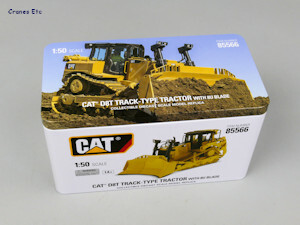 The tin is high quality and includes pictures and details about the real machine. 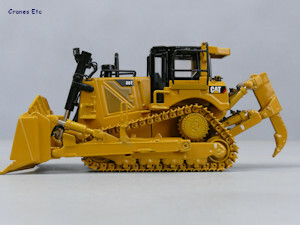 The review model had no missing parts or defects. 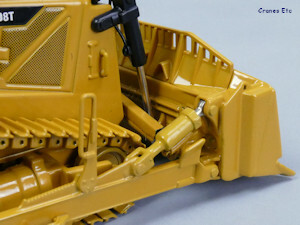 An instruction sheet is included which describes how to install the operator, and there is also a mini catalogue of the Diecast Masters range. The underside has some good detailing within the casting. The metal tracks are nicely detailed with bolt heads. The track frames have the outline of the rollers formed within the casting and they are non-functional. The high drive sprocket is plastic which is slightly off colour. 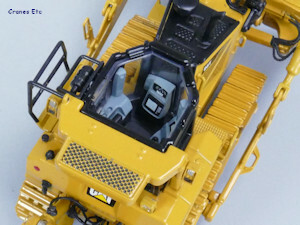 The cab structure is metal and the hand rails are soft plastic, and the roof is plastic also. 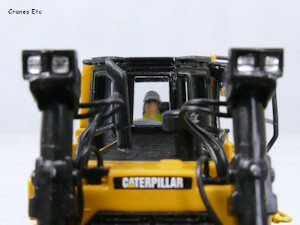 Inside the cab the seat back has the Cat logo, and the operator is in the usual Diecast masters style. Behind the cab there are work lights and red painted stop lights. The single-shank ripper assembly is metal and the tooth is sharp. The rams are plastic but they are detailed and have a good colour match. There are plenty of hydraulic hoses. At the front the engine cover has grille details formed by graphics and the exhaust and air intake are plastic. The front grille looks good. The big metal dozing U-blade has wear plates detailed at the bottom and there are perforations in the grille on the top edge which are formed by having a plastic top edge. There are hydraulic lines running to all cylinders. 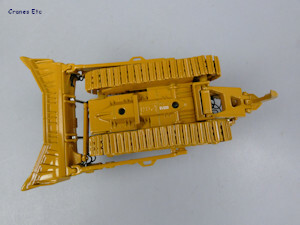 The tracks roll very easily in the hand and are spring-loaded. The ripper assembly has a good range of movement. It can be parked high or positioned with the ripper down. The blade can be raised and lowered and the mechanism is reasonably stiff. The tilting function has some movement also. 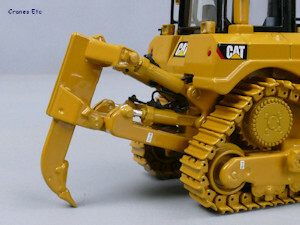 The operator can be added or removed via the detachable roof. 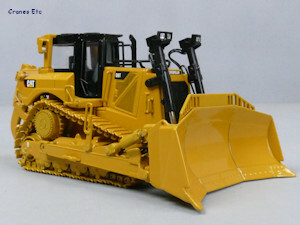 It is a good quality model with a high metal content. The paint is good and the graphics are sharp. This is a nice version of another Caterpillar heavy tractor, and it is very well presented in its metal tin. 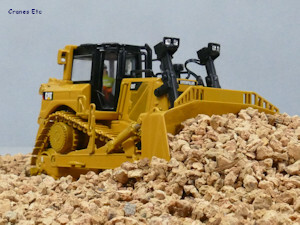 The removable operator gives display options. 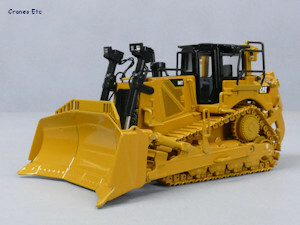 The model first appeared in August 2018. High drive sprocket colour is slightly off..
Top of the blade has a see-through grille. Operator installed in eth cab.